Rubber rolls are heavy, and material is thick. I needed a professional installer, who worked very hard to cut through the material. Rolls were not matching in color of black, and three rolls were damaged on the sides upon delivery so that the seams have divots and chunks interrupting the seam in some places. I do like the flecks of color in the regrind rolls and samples sent before hand were a good example of what was delivered. Love the product. Will be recommending to all my friends. When the folks from the fitness store delivered they gave many a compliment. The regrind rolls look so good and at a cheaper price than the virgin rolls I can't see any reason why you'd want to pay more for the same product just to have it all be one uniform color. But these pretty much are anyway, it's just confetti color. Plus, keeping over 30 tires from going to the landfill makes you feel good. The rolls come in HEAVY so make sure you have some helpers. I guess this depends on how many rolls you're getting but I got 3 4x25 so it was three 200lb rolls delivered on an 18 wheeler so just keep that in mind. installing it is easy but can be a bit of a workout so just be prepared, make sure you back and core are ready! My only issue is that the off-gassing on these is significant. And the weather here is starting to get better so I was able to keep the windows open quite a bit but it was still VERY pungent for a few weeks. Regardless, would order again a hundred times. Got 3 rolls of 3/8” 4x25’ for my home gym. Each roll is very heavy so me and my wife carried them down to the basement together. Make sure to use a t square and cut the edges so they are straight. They are very easy to trim. Looked great after we installed. Used double sided tape that was sold to us when we ordered. Overall, this was a great choice, looks great, 3/8” was a perfect thickness. FIRST: I placed my order on Tuesday, the rolls were in my driveway on Friday. SECOND: I called to ask questions before I placed my order and my rep was extremely helpful. His recommendations were spot on AND he gave me a screaming deal for the thicker commercial grade roll. Lastly, the product is amazing. The rolls lay and cut fairly simple. YES, other reviews are correct, the ends are NOT cut at a 90 degrees, but that's why you cut it yourself. It is not that difficult. Here's what I did, I used a 90 straight edge, made 2 or 3 score cuts, folded the roll at the score line, and then cut right through. When it was all completed, the seems are not noticeable at all. It looks like one large rubber floor. Amazing product. Super Happy that we went with Rubber Flooring Inc. Least expensive anywhere. Fastest Shipping and Great Customer Service. Would rate it 10 stars. The product was delivered earlier than anticipated which worked out great. The sales person was very helpful and accommodating a last minute order change. The flooring looks beautiful in my dog training studio. Very happy with the whole experience. I ordered the confetti pre-grind roll in ?" because it was the most affordable price for the exact product I wanted. We don't do much plyo work in my gym and like the FAQ says, it's DENSE. I was afraid it would look like a daycare—that the colors would be primary and in big splotches. But it is a vast array of all the colors on offer—tan, yellow, orange, teal, purple... it's pretty much the best looking rubber mat flooring i've ever seen and I am really into design and aesthetics. After a couple days the ripples totally flattened, and the mats sat in the driveway on their pallet rolled up for over a week due to flooring issues on the construction side.... The rubber smell evaporated in a couple days as well. They are just perfect. I even have some leftover that I cut into 2x4' strips and stacked so I can use them as a deadlift platform, and for deficit or partial deadlifts. Recommend this product to the moon and back. Very good product for gym flooring, but a some cut a bit uneven which makes for bowing in a few spots. Good quality. Love the colored specs. Only issue was that 2 of the 4 rolls were not straight one of the ends. It would been helpful if the rolls were over- cut a couple inches to allow for the extra we had to cut off. We ended up having to piece a 2” piece in at one of the walls due to the shortage of cutting off end to make straight. Great product, but very disappointed to receive 3 rolls in 2 different colors.. Why? Do you want this in your gym? Looks like I bought my rubber flooring in a yard sale..
Great product, sturdy, easy to install. Purchased 4 rolls for my home gym. It turned out great. Would be 5 stars, but 3 of the rolls were one type of tint and the 4th was way different. But that was communicated that there could be differences. But it was very different. But we made it work and are very happy. After reading reviews and getting samples, I purchased 25 feet of regrind to replace the typical black square exercise tiles that are somewhat spongy and very flexible. The square tiles posed problems by sliding or coming apart during exercises that require lateral movements or exercises like burpees. I cut the regrind into two equal lengths and placed them side by side on my concrete patio. The stuff is very heavy and rolled out nice and flat. Installation was much easier than expected. They have been excellent. Very stable for lateral movements. Over the course of a workout, they might separate a quarter of an inch. I won't have that problem anymore after I apply some double stick carpet tape. Recently decided to upgrade my boys workout room. Finally decided on the flooring and went with the 3/8" regrind rolls. Very happy with the quality of the rubber. It looks great, and cleans easily. 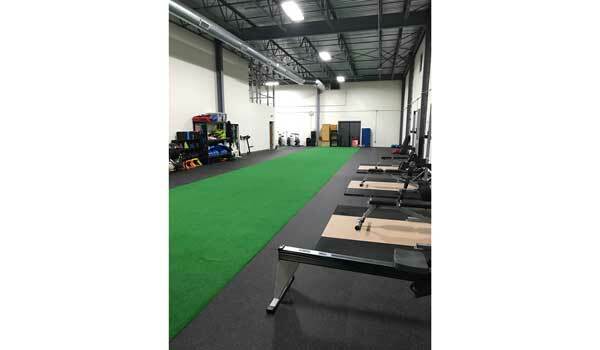 This regrind rubber flooring product is perfect for fitness classes. The cost is very reasonable and good quality!! Highly recommend! 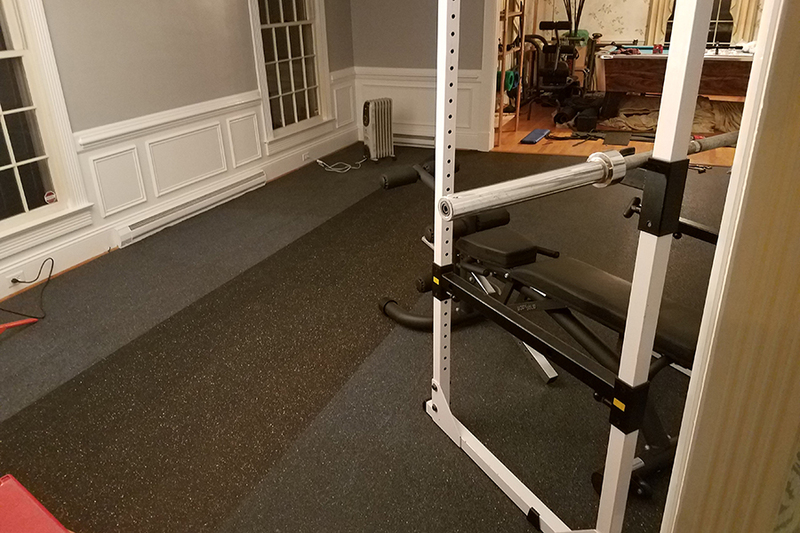 Recently purchased 3 rolls (3/8" thickness) to cover the floor in a small fitness studio (~400 sq ft). Floor has been down almost a week now and I'm very happy with my purchase. It looks great, holds the equipment well (no sliding or marks in the rubber), and keeps me from disturbing the business downstairs. I was expecting a heavy rubber smell that would linger for weeks, but this has not been the case. We ordered 81 feet of the launch turf roll and eight rolls of the 50 foot 1/4 inch confetti rubber flooring. We are extremely pleased with how the gym turned out. The Customer Service was extremely helpful. I am planning on using Rubberflooringinc to finish out my next facility. I've been very happy with the 3/8" regrind rubber flooring I purchased. It was heavy but my husband helped me cut it in our driveway a little larger than needed to make it easier to move two smaller rolls than one big one. Then he cut it to fit with a utility knife and metal ruler. We easily laid it out in my office over an existing berber wall-to-wall carpet. I'm finding I don't need tape to keep it in place but I did use some where it abuts a different area rug (but mostly to keep that other rug from slipping. There was a strong rubber odor initially, but within a month it dissipated to the point that I don't smell it. An open window and fan got me through the worst of that. It's comfortable underfoot and deadens noise. I'm using it on one side of my massage therapy office to do one-on-one personal training with light equipment or body weight. I've vacuumed and swept it easily. And mopping with Dawn/water is easy enough. The 3/8" size seems to be a great thickness - balancing out how heavy it was to carry with durability/comfort and stable enough on top of an existing carpet. First, the customer service representative Fatimah was terrific. She was extremely helping when we were researching the flooring and throughout the entire purchase process. We ordered samples which were helpful. The rubber rolls arrived in good condition and were fairly easy to install. We purchased 25 foot long rolls so they are heavy and a bit cumbersome. We are extremely pleased with the flooring in our fitness room. Purchased the 3/8" regrind material. Rolled it out cut it off and done. It is heavy enough that it does not wrinkle or move at all. Great Stuff, Good Price.